See more articles about parent involvement in our Administrator's Desk Channel. Parent involvement in schools is much more than parent conferences and PTOs... In the resources below, learn about practical ways in which schools are involving parents. Read about parent involvement strategies that are working for others -- and that could work for you! Planner Nights for Parents Give Students a Jump on Projects Teachers were concerned about students effort on projects, so the schools Title I teacher planned a Project Planner Night. Parents appreciated this chance to gather project materials, clarify instructions, see sample A and C projects from previous years, and more. Project Tutor Helps Boise Students Stay on Target in Reading and Math An inventory of practices in one school district revealed that many of its schools were deficient in the area of training for school volunteers. Project Tutor was created to prepare community volunteers to work in the neediest schools and support reading and math instruction. A California-based foundation called the Stuart Foundation is helping schools all over the country strengthen parent-teacher relationships through home visits. The project is said to increase attendance rates and test scores and decrease disciplinary measures like out-of-school suspension and expulsion. Reaching Out to Parents Over Brown-Bag Lunches Administrators at the school and district level are finding that inviting parents and community members to chat over brown-bag lunches gains them allies in the community and helps keep everyone informed. Included: Tips and topic ideas for brown-bag lunches. "Extreme Read--Warrior Style" Connects Kids, Parents, Teachers Through Books Students at one Florida middle schools read and discuss young adult novels as part of the school's annual "Extreme Read." The experience gives students a chance to see those around them -- peers, parents, and even the math teacher -- as fellow readers. Ten Ideas for a Successful Take Your Family to School Week PTA Take Your Family to School Week is just one of the PTA programs revitalizing parent involvement in education. This special week in February is easy to implement too, with these ten ideas and the PTAs online guide and poster. Got Three Hours? A School Needs You Who could say no to giving three hours to their child's school over nine months? That's what the founders of the parent volunteer program Three for Me reasoned -- and they discovered once parents got a taste of volunteering, they were eager to keep coming back. New Teacher Advisor: Developing Positive Parent Partnerships If we are to reach our goal of producing successful students, we must partner with the people ultimately responsible for those students -- their parents. Discover how you can develop and foster such a partnership. Parents and Teachers Working Together How do you establish and maintain a good working relationship with your students' parents? The Education World Teacher Team shares their strategies for increasing parent involvement and ensuring parental support. Parent Planning for Parent Involvement Too often administrators view parent involvement programs as neglected gardens. If by chance they grow and bear fruit, terrific. If they don't, it can't be helped. But a national institute says that, with some planning, all schools can grow parent involvement programs. Let The Show Begin! Open HouseTech NightParent-Teacher Conferences...A number of events provide teachers the opportunity to show off student work. Why not do it with a single PowerPoint show that incorporates slides from a number of student presentations, and runs in a continuous loop? Fifteen Ideas for Fundraising Fun Need to raise money to fund a school trip, buy new uniforms, or for needed classroom supplies? Education World offers 15 fun ideas for school fundraising. Included: Idol competition, Penny Challenge, poster sale, Anti-Dance, more. Voice of Experience: Most Direct Route to Parents Is an E-Line Educator Max Fischer has been doing a little independent research on the effectiveness of phone calls, written progress reports, and e-mail in raising student achievement. Which communication method do you think he and his teaching teammates found to be most effective? More Principals E-Mailing Parents Instead of picking up the phone to call parents, more principals are tapping on their computer keyboards. Increasingly, principals are finding that e-mail is the best way to communicate, for them and parents. Tips of Welcoming Parent Volunteers Into Your Classroom Educator Peggy Cramer reflects on her use of parent volunteers in the classroom. Teachers who don't take advantage of parents as a resource are missing out, she says. Included: A volunteer invitation letter, activities, tips, more. 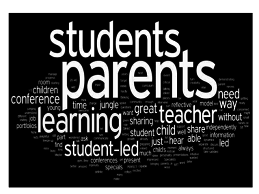 In a Million Words or Fewer... A simple activity offers a powerful tool for learning about your students and connecting with their parents. "I was suddenly a part of each child's life," teacher Trisha Fogarty said. Principals Share Parent Involvement Ideas Principals share more than 30 practical ideas for including parents across the grades! Math Night by the Numbers Is it time for a "Math Night" at your school? Math Night gets students excited about math, familiarizes parents with the math curriculum, and encourages families to continue the fun of math at home! Included: Advice from organizers of Math Nights at schools across the country. How Can Parents Tell If Teachers Are Doing a Good Job? How can parents tell if their child's teacher is doing a good job? Sometimes parents' ideas are misinformed. Ed World's "Principal Files" team members offer their perspective. Included: Look at the work students bring home and "the hard sell." Family Reading Nights Create Avid Readers For administrators looking to increase student reading at school and at home and improve parent involvement -- which would be most administrators -- family reading nights have proven successful for many schools. Included: Suggestions for family reading night programming. A "Signature Event": The Autograph Auction as a School Fundraiser Marty Kelsey, a teacher and an avid collector of celebrity autographs, saw a potential event that would be entertaining, require little investment, and, hopefully, raise ample funds. Included: Tips for holding a successful autograph auction or other fundraising event. Party! A Year of Special School Events Getting parents involved is no easy task. But Education World's "Principal Files" team offers some great ideas for school-wide events that are sure to draw parents in large numbers. Included: More than 30 events to add to your school calendar! Family Fitness Night a Popular School-Wide Event Reaching students with the message about the importance of fitness isn't enough. Schools are going for the gold with events designed to bring in kids and their families too. Included: Four teachers share different Family Fitness Night approaches. A Dozen Activities to Promote Parent Involvement! Many parents say they feel unwelcome or uncomfortable in their children's schools. Included: A dozen activities to promote parental involvement and ten tips for involved parents. High Notes, Hayrides, and Hot Dogs: Making Open House a Hit! Ideas to help administrators and teachers make open house night more enjoyable and effective. Open House: When First Impressions Matter Good first impressions make a difference, and the first open house of the school year gives administrators and teachers a chance to gain parents' support. Included: Ideas to help make your open house a success. Increase Parent Involvement With First Day of School Activities Read about how schools across the nation -- in urban, rural, and suburban areas -- are breaking down barriers by making the first day of school an exciting holiday with special activities that include everyone. School Book Club Gets Kids and Adults Involved! Parents at Northwood Elementary get involved in school academics by participating in a school book club that promotes fun and a love of reading. Included: Tips for starting a book club in your school. Parents Step Into Students' Sneakers for a Day! Here's one school's approach to increasing parents' involvement in their students' education: Send Mom and Dad back to school! Included: Kids and parents share their thoughts about spending Parents Day together. Middle School Helps Parents With Resource Center A parent resource center in a Connecticut middle school helps parents understand their middle-school-age youngsters. Included: Tips for starting a parent center in your school! Parent- and Community-Involvement Strategies That Work From an individual student's notebook to community-outreach programs, here are five approaches to parental and community involvement that work. Plus: Links to dozens of online resources! Organize a "Literature Day" (and Night!) at Your School Oranize a Literature Day for students. Then do the whole thing over again at night -- so families can be included! Plus: Activity ideas and tips for organizing your own event. Back-to-School Letters and Survival Kits Build Communication Some schools provide "survival kits" to help students weather the first few days of school. Some even welcome teachers with "survival kits" of their own! Included: Examples of kits for students and teachers. Student-Led Conferences Hold Kids Accountable Student-led conferences can actively engage students in their learning process and increase parent attendance at conferences. Included: Highlights of research about student-led conferences. Meeting With the Parents --- Making the Most of Parent-Teacher Conferences Research has shown that parental involvement is the most important factor in a student's success in school. For many parents, however, that involvement is limited to attendance at parent-teacher conferences. Learn how to make the most of the opportunity! Included: Specific strategies for involving urban parents and a printable conference planning sheet and conference report form. Beyond the Bake Sale: Parents Can Make the Difference in Countless Ways Kevin Walker, the founder of Project Appleseed, has created a list of 37 different ways parents can help. Included: The Project Appleseed Parental Involvement Pledge. 'The Parent Trap' -- Luring Elusive Parents to School How can schools do more to encourage busy parents to get more involved in their children's school activities? Find out on the Internet! Included: Ten online resources with information and advice. School District's TV Talk Show Increases Parent Involvement In the Houston, the school district airs a live interactive talk show in which parents participate. Teacher Visits Hit Home Home visitations by teachers get parents involved in their child's education -- and they let parents and children know how much teachers care. Included: Tips for starting a program. Parents Tune In to School Radio SchoolCast FM helps schools solve the communications-with-parents problem. The small FM radio station provides everything a school needs to get daily messages on the air and requires no FCC license. Parental Involvement Is as Easy as PIE! A special teacher-created program makes parents true partners in their children's education. Home-Grown Students: Program Bridges Gap Between School and Home A program in Sacramento, California, trains teachers in the art of home visitation. Fathers in Schools: How Dads Make a Difference Education World offers ways to help fathers connect with schools. Included: Books for dads and kids to read together! Posting Students' Grades Online Keeps Parents in Touch and Kids on Their Toes! Education World talks with K-12 teachers who are posting students' grades online. Included: Online resources and software you can use to post your own grades online. Bringing Families and Schools Together-- FAST! The Families and Schools Together (FAST) program is recognized as one of the most effective parent-involvement programs in the country. Teacher-Created Web Sites Link Home and School-- Virtually! This week, Education World editor Linda Starr shares the stories of teachers who have seen the possibilities for using the Web to connect to parents. Included: Tips for making connections to parents on school and classroom Web sites! Teachers, Take Note! Schoolnotes, That Is! Take a look at how teachers are using Schoolnotes.com to expand their instructional environment and maximize learning opportunities for their students. Included: Comments from teachers who share ways in which Schoolnotes.com is helping them connect with parents and the community.